If you use your vehicle for towing or to frequently carry heavy loads, we recommend that you consider transmission cooler. Transmissions are the car’s main component for transferring the engine’s power to the wheels, generating a lot of heat in the process. When put under extra stress, the manufacturer recommended transmission fluid is not always sufficient to cool its gears. Cooler adds extra protection against overheating during times when you’re rough on your transmission and can lengthen its overall lifespan. So, don’t take a chance on overheating, bring it by JR Auto Repair today! Our service and repair center is located near Durham, NC. If you ever see spots of red oil under your car or notice that your transmission fluid is low, your transmission may need to be resealed. Both cases are usually a sign that your transmission is leaking fluid. During a reseal, a technician will inspect the underbody of your car for any external seals or gaskets that could be leaking. If the transmission is running smoothly otherwise, all of the leaky external components will be replaced without having to remove the transmission. If the front seal must be replaced, however, the transmission will have to be removed first. So, if you notice any pools of red liquid under your car, be sure to bring it by our service center, located in Durham, NC. One of JR Auto Repair’s expert technicians will be standing by to assist you. Here are some common symptoms of a malfunctioning transmission, courtesy of JR Auto Repair. If you’ve experienced any of these issues with your vehicle, bring it in for a diagnosis. Our transmission service and repair center is in Durham, NC. Unusual Sounds – This could be anything from a whirring, clicking, clanking, squealing, or grinding. Engine Light – If your check engine light comes on. Odd Odors—Strange smells around the hood or underbody of the vehicle, especially burnt smells. Slipping—If you’re trying to accelerate your vehicle and it’s going slower than it should, but the engine is racing. Stalling—Your vehicle stalls as you press the gas pedal. 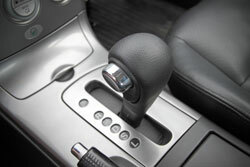 Trouble Shifting—If your vehicle is shifting unexpectedly or if you notice it shifting early or late. Leaks—Fluid stains under or around your vehicle. Sticky Shift Handle—Noticeable difficulty moving the shift handle, in any position. Difficulty in Reverse—You shift into reverse but your car doesn’t budge. Shift Indicator Doesn’t Work—If you start your car and the shift indicator is not on (P) or (N) then it’s not working properly. Vehicle Doesn’t Move—While the car is in drive it doesn’t move, even if the engine is racing. No Power—There is no power when you press the gas pedal. Trouble in the Morning—When you first start the vehicle, it has difficulty moving or shifting. Movement While in Park or Neutral—If your vehicle moves or jerks when in park or neutral. Downshifting Doesn’t Work—If you’re in icy conditions going downhill, you can use the transmission to slow the car down. If this is not working, you may have trouble.